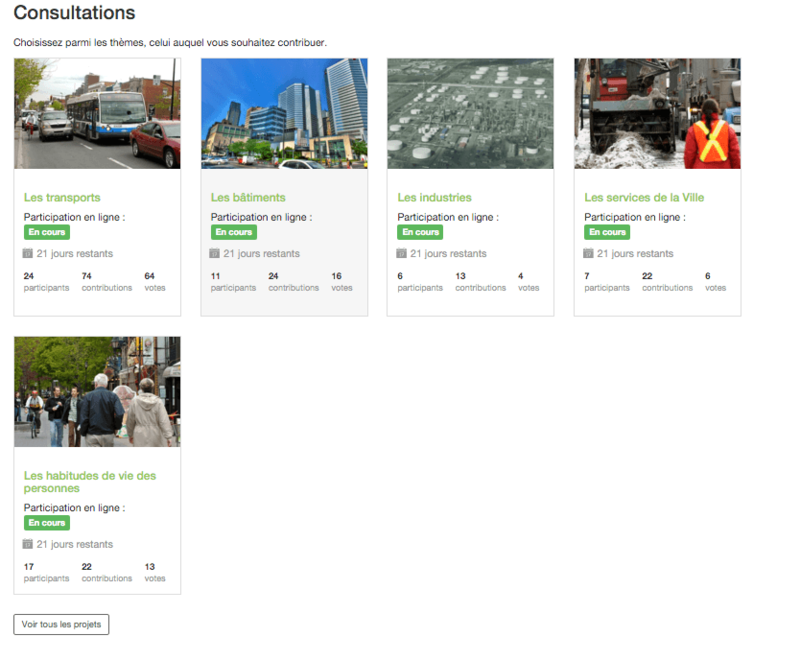 Montreal has an office responsible for soliciting public input on issues, the Office de Consultation Publique de Montréal. You may not have known that, but now you do. Going back to 2002, I can see their consultations on the Turcot Interchange (ha!). Currently, they are running consultations on l’îlot Wanklyn, the concordance of planning and development in Greater Montreal, and the reduction on the use of fossil fuels in the city. The UN is holding a conference on climate change from November 30 to December 11 2015 in Paris. Montreal’s mayor is attending. A group of citizens asked the city to hold a public consultation about reducing our consumption of fossil fuels. Montreal’s objective is to reduce fossil fuel emissions by 30% from 1990 by the year 2020. A public information session was held on October 29, and since, an online consultation is taking place. This will continue until March 2016. The online space (HERE) is intended as a form of debate. 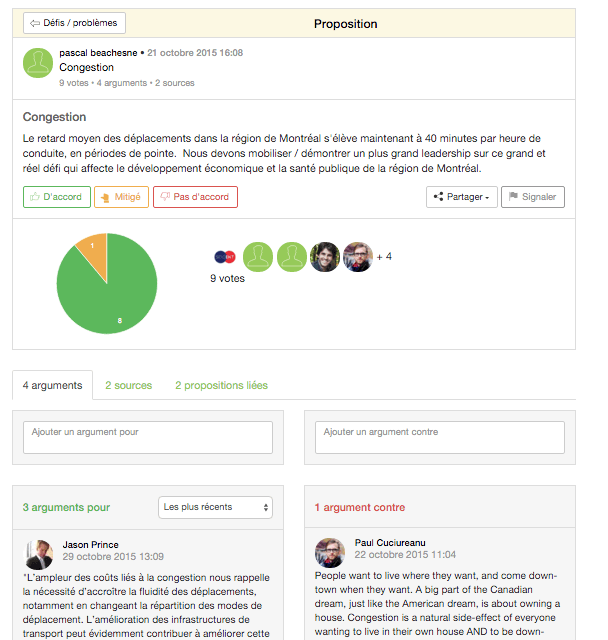 Citizens can set out proposals and either affirm their agreement or disagreement with them. Different areas are identified: transportation, building, industry, city services, and life habits. I had a look at the different themes to see what I thought of the contributions. 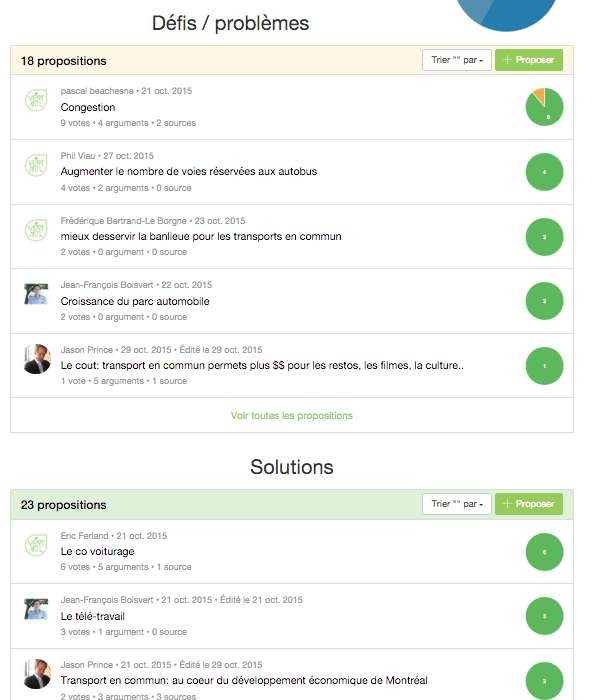 The transportation one is broken down into propositions of problems and solutions, with individuals posting their ideas. Clicking on a proposition allows you to provide input, as well as up-voting or down-voting an idea. I’m not sure if I think this kind of thing results in solutions, so much as it lets people voice out. Nonetheless, if you want to let your voice be heard about fossil fuel use in the city, this is the place to do it. After all, if you don’t speak up for yourself, someone else will be listened to in your place. Additionally, part of this pre-Paris public consultation is a week of citizen activities from November 15 to 20, culminating in is a “major citizen activity” on November 21. Those interested in creating an event can sign up here. Those wishing to participate should watch HERE. There are some events listed, but they don’t sound like very much: environmental awareness is about as concrete as the proposals get at the moment. However, the organizations behind these activites are legit: Republique, Éco Quartier of Villeray and NDG, and MOBA/Mobilité Alternative. After the Paris conference, there will be a series of other events. In February, for example, there will be a creative marathon where the technologically skilled and the environmentally concerned can come together to create some of the proposals.